I need to have a keg of something 'accessible' and 'unchallenging' ready for the end of July. I've been asked to knock something up for a birthday party, but the vast majority of people there will be lager drinkers that don't like anything too 'big'. I'm thinking a mental amount of hops and or bitterness is not the way to go. I don't have the kit to lager properly either, so that option isn't available. I need something that's refreshing, hits the spot but that will appeal to lager chuggers. 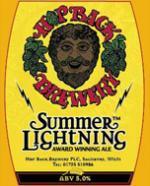 Hopback Summer Lightning is a classic beer that's simple and delicious, it has a hop presence but it's subtle, it's crisp, clean and refreshing. The bitterness isn't too big and part of its success is down to the fact that there's enough familiarity for lager drinkers to enjoy it. The beer's recipe, unsurprisingly, is quite a simple one. One grain - Optic Pale Malt. One hop - East Kent Goldings. Sorted. I'm going to take this base and try my best not to impulsively add a truck load of aroma hops after flame out. I'll brew it to around 1040-1045 and bitter to 20 IBU's. It's possible to 'ranch' yeast from the bottom of commercial Summer Lightning bottles. I've attempted this in the past and managed to have some success. This time around though, I need something quicker and easier, so I'll go with trusty dry US05. It's reliable, clean and preserves hop aroma and flavour. The summer months are always difficult for brewing but with a few ice packs I should be able to keep it around 19C. Quick and dirty, but experience has taught me that this kind of beer can be the most challenging to brew. To a certain extent, you can mask faults with 10 per cent alcohol or a load of dry hop, but when a beer is as simplistic as this one, there's nowhere to hide. Let's see how it goes. If you're reading this thinking "that isn't the Summer Lightning recipe", it's quite possible that there are different ones out there. Commercial beer recipes are in a constant state of flux and without doubt some of the information out there is probably wrong. That's not really the point though; the result I'm after won't be impacted by swapping Optic for Maris Otter. Now you are using the word 'simplistic' in your beer descriptions! I can understand a recipe being simplistic, but still not how a beer can be simplistic. I am not objecting to you using the term, just that you'll have to explain it to me some time. Good shout ... so I have!! I did that without realising to be honest. Like you say though, I mean it in context of the recipe. Simplistic as in 1 grain and 1 hop. When it comes to describing flavour, I think the only way you can apply 'simplistic' is sort of as the opposite of 'complex'. If something tastes of one thing and one thing only, maybe you could describe it as 'simplistic'?? I'm not a fan because it implies a negative opinion. Any single hop forward beer is going to taste like that single hop ... does that make it simplistic? Based on the definition above it does, but is that a bad thing - no. See what I mean?